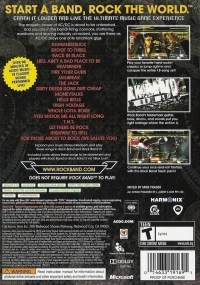 Description: This is a track pack for the Rock Band games and in the United States it was only available at the Wal-Mart and Sam's Club chains of stores. 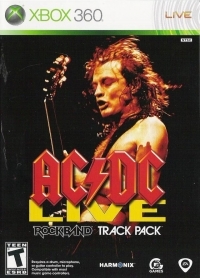 The original game is not required to play and Volume 2 includes all eighteen songs of the album Live at Donington by rock band AC/DC. Contrary to the other track packs, it does not include many of the regular game features such as avatar customization or online play. The game also includes a code to export the songs to a hard drive for use in other Rock Band games (PS3/Xbox 360). 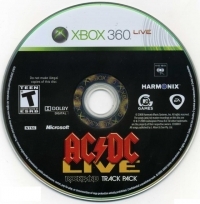 Box Text: AC/DC LIVE: Rock Band Track Pack is a fully-featured, standalone extension to the multi-million unit selling, genredefining, cultural phenomenons Rock Band and Rock Band 2, the ultimate social music game experiences. AC/DC Live lets you and your friends relive AC/DC's epic 1991 live performance at Donington, UK, through the eyes of Brian Johnson, Angus Young, Malcolm Young, Cliff Williams, and Chris Slade.